Ghent is not an enormous city, but it doesn’t have to be. The combination of students, history, bikes and neverending cool spots make it the perfect weekend getaway. It’s manageable whilst still being surprising and open-minded. But what to choose out of all those unique spots? Out of the already astonishing list made by our Spotters, we chose the very best for a beautiful summer day. So pack your bags, take that train or plane and go for it! 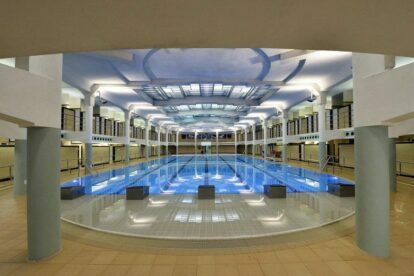 Not many people realize that at this place they are swimming in the oldest covered swimming pool in Flanders. In Ghent, all public baths closed down in the 16th century, but with the industrialization of the 19th century the need for more hygienic circumstances became stronger. The Van Eyck swimming pool was built in 1886 and in the early days it was only used in summer as a swimming pool. Today it meets all modern and hygienic needs as it has been recently renovated. Most likely you’ll have a shower in your hotel or B&B, but if you decided to sleep under one of the Ghent bridges and still want to take a hot shower in the morning, this is your place to be. The cellar is filled with private baths and showers, still used today for people who do not have a bathroom at home. Once upon a time, there was a cheesemaker in Ghent, called het Hinkelspel. From 1982 the cheese was produced within the city. In 2011 they decided to move the production to a village close to Ghent, but the shop would remain at its original location. The production hall was empty and recently got a new function: a covered market hall. Hinkelspel searched for partners and the new Lousbergmarkt was born. Besides the brilliant cheese, which has been here for decades, you can now find all kinds of other high-quality products. 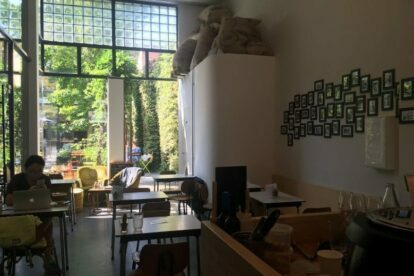 Bread, biscuits and Danish (actually, Belgian) pastries can be bought at Copain. 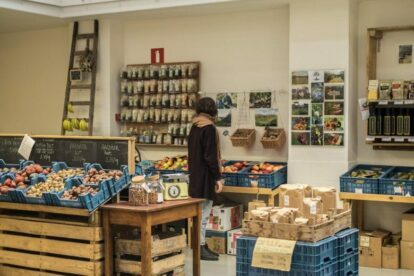 At de Vroente you can buy organic fruit and vegetables. And at Dochters van de Jaegher you can taste almost everything which is sold on the market. It’s a vegetarian restaurant and an ideal place to have brunch or lunch with locals. Nothing beats a good book on a sunny afternoon. One of my favorite places to enjoy some me-time is a spot called ‘Appelbrugparkje’. 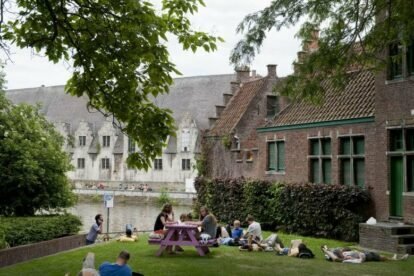 It’s a tiny park right in the center of Ghent and worshiped by its residents. Ready for a really cool concept? Okay here we go, I present to you: Vos. During the day a really nice coffee bar and lunch café, during the evening a restaurant. Vos is not really in the city center, but definitely worth the eenie meenie miney bit of traveling! You’ll find yourself in a really nice atmosphere, and they have really nice staff! It’s the perfect stop to relax after a day exploring the city. Go ahead and get some energy with a good coffee. At night Vos becomes a restaurant. We all know sharing is caring, so Vos thought it would be nice to use this concept for the food they’re serving. Yes, you’ll share your food here with your friend, which is super awesome! I’m more into a movie experience in an alternative setting far away from the commercial blockbuster world. Sphinx cinema’s program includes the popular as well as the more alternative movies. The atmosphere of this dark brown cinema is one of the reasons I come to it. 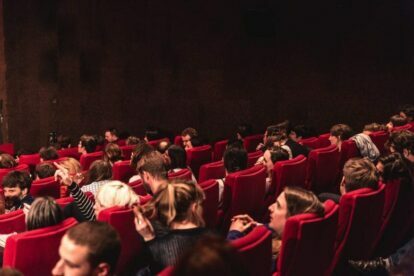 During the year they often have small themed festivals, and Sphinx is also a location of the Ghent Film Fest in October. This building had already been a movie theatre in 1912, and it is the only remaining one in the city center. Despite what the facade says, the building doesn’t date from the 17th or 18th century: the entire row of facades was build at the beginning of the 20th century, together with the Saint Michael’s Bridge. Sorry people, this part is all fake. But still, it doesn’t remove anything from the beauty of our city.